Shopping as a first date is not a good idea. You may both get so caught up in what you are shopping for that you don’t really give yourselves enough opportunity to get to know each other. The focus of the date changes from getting to know one another to getting to buy goods. Also, you don’t really know the shopping habits of the other person. They may get really stuck in one particular store that you have no interest in being and that may cause you to become impatient or irritated. The other person may have no real concept of time when it comes to shopping. You may feel the need to move on to another store or even just try doing something else but the person just keeps shopping because they have really gotten lost in seeking out what they are looking for. Again, by going shopping on the first date, you take away the focus of the date from the both of you getting to know each other to the goods that you may both be shopping for. Also, shopping as a first date may put the both of you in long lines where you are waiting to pay for certain items that have been purchased. These lines can really get old and irritating after a while. Yes, it may be the opportunity you both have to talk but it would simply be because you are both trying to kill the time. Hence, the conversations that you would be having may be more on the superficial side than on the substantial side. Also, if one of you is relatively impatient, waiting in these lines could be a problem. If the person that you are on a date with has quite a few items that they have purchased, you may become even more irritated because you would have to wait even longer when they get cashed out at the register. This puts a negative spin or atmosphere to the date. You may get to the point where you don’t even want to keep standing in these lines anymore because your legs or feet are tired. At this point, you may just want the date to end. This is not a good place to be at mentally. You should be excited about getting to know your date on a first date as opposed to just wanting the date to be over because you are tired of waiting in lines. 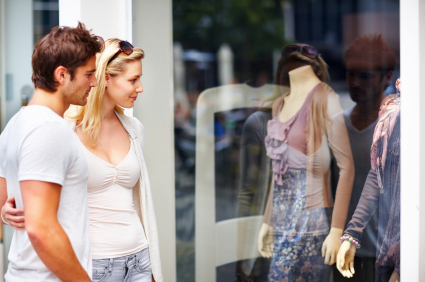 Shopping as a first date may also put you in a position where you worry about how your date will judge your taste. If you were thinking about purchasing an item, you may feel a little bit hesitant because you may be worrying about what your date would think about the item. Hence, you may end up not purchasing anything or purchasing the item with a lot of trepidation. You may end up even deciding to buy something totally different that you may not even really want because you believe that this item would be more acceptable to your date. In other words, you make yourself uncomfortable and anxious the entire date. Hence, it is best to avoid going out shopping on a first date. It doesn’t mean that shopping as a date can’t work on a later date. However, for now, it is best to focus on building some rapport and getting to know one another in a less intimidating setting. Previous PostI’m Confused. Do I Like Him Or Not?Next PostWhat Are Some Good Get-To-Know-You Questions? Man’s not been going on dates so man doesn’t know. Man hasn’t had to think about first dates. Say you both meet at a coffee shop or juice/smoothie bar for your first date. You could use conversation during your first date with her to get clues as to what she likes to do for fun. You can use this information to then plan future dates.